My rating: 8.5/10. Great watch. Value for money, durable watch. Hello, today I’m doing a GD-100MS-3ER review. This is a military style timepiece with a reverse colour digital display. 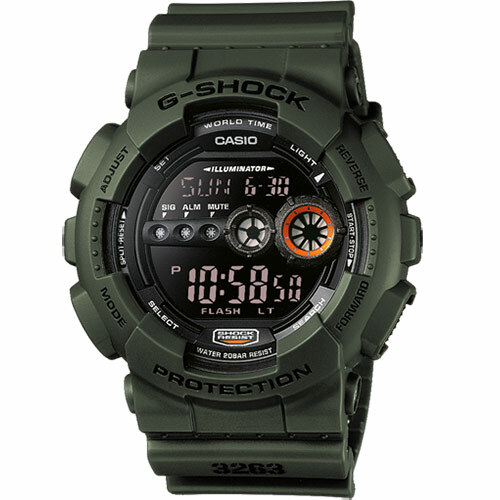 It’s another extremely popular durable G-Shock watch that’s affordable with an impressive 7 year approximate battery life. I hope you enjoy this G-Shock GD-100MS-3ER review below. 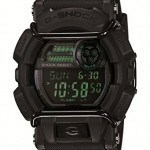 The case for this watch is pretty huge as you’d expect from Casio’s collection of oversized G-Shock watches. This model has an interesting reverse colour digital display that makes things a little different. I think this works very well with the dark green resin surround of the stainless steel casing. These watches focus on shock resistance and that thick resin surround makes them extremely durable, sturdy watches. Protecting the front of the watch we have a specially hardened mineral crystal glass. This style is glass is exactly what I’d expect to find on a watch that’s designed to offer shock resistance. The glass is scratch and shatter resistance, which makes it ideal for this type of watch. As we find with many of the G-Shock watches, this model has an impressive Japanese quartz movement. These movements are reliable, accurate, and require very little in the way of maintenance. This model even comes with an approximate 7 year battery life that’s pretty damn good. 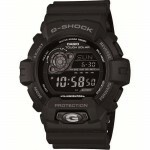 It’s another typically large timepiece from the G-Shock range. This watch has an oversized style with a 51mm casing diameter and 18mm thickness. There’s no doubting this is a chunky watch that’s really going to stand out on your wrist, and many people love this feature. Just remember that if you have smaller wrists this type of oversized watch might not be ideal for you. The strap is made of the same durable resin as the casing surround. It’s comfortable and fairly thick, the width of the strap is 26mm that suits the rest of the watch sizing quite well. The strap fastens with a standard buckle style clasp. 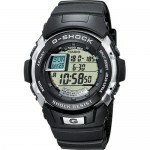 G-Shock are known for their multifunction capabilities and this timepiece is no different. Extra functions of this watch include a world time display, countdown timer, 5 alarms, super led light, stopwatch, world time display, automatic calendar. There’s also a display flasher, that’s a light diode that flashes as soon as an alarm, a countdown-time or the hour signal has been reached. The water resistance level of this watch is 200m, this is what you find in many of the G-Shock watches and something I’m always impressed with. A rating of 200m / 20 Bar / 600ft makes this watch suitable for professional marine activity, serious surface water sports and skin diving. Case Stainless steel casing with resin surround, sizing diameter: 51mm and thickness: 18mm. Dial Digital display. The window lens is made of mineral glass, this is specially hardened to be resistant to scratches and knocks. The G-Shock GD-100MS-3ER is full of useful features and built to last. G-Shock are the go-to brand for many people seeking a durable watch that can withstand much more than your standard watch. They’re highly functional with all their extra features that can come in handy. This would be ideal for something with an active outdoor lifestyle in need of a tough watch. After looking into the watch design, quality, features, and pricing this watch received an 8.5/10 from us at The Watch Blog. Hope you enjoyed this G-Shock GD-100MS-3ER review. Find more watch reviews below.